The National Championships offer you the opportunity to benchmark and compete against the best in the country. These races are also the cornerstone to National Team selection. U10 and U12 do not need to qualify for the races which means the race series is perfect for these racers. We suggest that under 12s be accompanied by their parents if this is their first camp with ATC. We encourage all U14 and U16 racer who qualify (under 400 BASS points in one discipline prior to the championships) to attend this camp. After all this is the National Championships and they have earned the chance to compete. You may want to attend as a residential athlete. We recommend this as there is so much extra help and support available from recovery training each day to ski tuning and video analysis. We have very limited spaces for the live in option on both weeks so if you would like to stay with ATC then please book early. Remember you need sub 400 points in one discipline to race at the British if you are U14 U16. No qualification needed in U12 and U10. Spring time in the French Alps is warm and sunny with hard snow in the mornings getting softer in the afternoons so the races start early. On snow we hit the slopes early for the training and racing week. 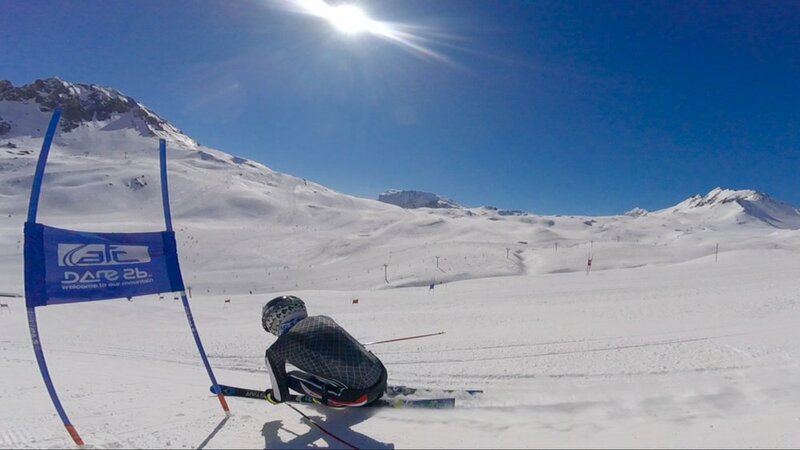 We book a private training piste in resort where we get a faster turn around. Afternoon skiing is a little softer snow so we tend to do a few runs in the gates then have some fun free skiing around resort. Off snow we have a study hour to allow kids to catch up on homework or reading. The physical focus is equally shared between fitness, stretching and active recovery. Time will be spent tuning their skis, under supervision of the coaches and in the evenings reviewing the video of the days training. There is no shortage of experience, qualifications and knowledge on the ATC coaching team for the Tignes camp. Olympians and ex-national team coaches Andy Freshwater and Sean Langmuir lead the team with Meghan Costello, Sofia Morton, Adam Piper, Jamie McWilliam. Lara Langmuir and Linda Freshwater will be the house mums on the Tignes camp. For U14 and U16 there is a National SL, GS and SG as well as a fun Parallel SL for everyone. These races are British seeded (BASS) races and results from the British Championships are the main factor included as selection for the British U16 and U14 Teams. For the U12s there is a GS and Combi and four training days with your ATC coach. We will have an accompanying adult on these flights. Please meet us at the Easyjet check in desk 2 hours before departure, check in your bags as soon as you arrive. Note: If you would like to take the team transport to the Spring camp in Hintertux then the team van will leave in the morning of the 13th April from the Paquis Hotel. Remember to bring your signed "parent consent for international travel form". Pick up will be from Geneva airport and will either be in the ATC van and/or with a local transfer/bus company. The journey takes approximately 3hrs. Training Week - Training Chalet La Tourne is a catered chalet that is located in the heart of Le Lac, Tignes. The chalet accommodates up to 21 guests, with its seven beautifully furnished bedrooms. There is a NEW snug area providing additional seating to the existing living area. There is a large terrace area for you to come back to and give those weary legs a well-earned rest, while taking in the beautiful scenery. The chalet’s large, self-contained professional kitchen allows our staff to create delicious dishes. Race week - Hotel Le Paquis has more than fifty years of heritage… A bona fide family tradition passing on the art of hospitality from one generation to the next. The hotel is located in the centre of the ski station. As it is part of a residential neighbourhood, it nears all sorts of facilities such as the swimming pool and sports centre, local bars and the town hall. Emergency medical insurance is required specifically you need to be covered for ski racing. We highly recommend cancelation insurance, because if you have to cancel your booking due to any reason within 4 weeks of the camp start date you will not receive a refund from ATC.